Update: Unlocked variants of Samsung Galaxy S9 and S9 Plus are receiving Super Slow Motion update as well with build ARH7. Samsung is now rolling out the September 2018 Android Security Patch OTA update. The September update is readily available for Samsung Note 9, Note 8, Galaxy S9 and, the S9 Plus. A noteworthy feature about this update is that it comes with the most anticipated Super Slow Motion and the support for AR Emoji. So download and install the latest OTA update for Samsung Note 9, Note 8, Galaxy S9. S9 Plus, S8, and S8 Plus. Following the Note 8, the support for the Super Slow-Motion and AR Emoji finally comes to the Galaxy S8 and S8 Plus. AR Emoji featured with the launch of S9 and S9 Plus. Since then the app have had several upgrades and improvements. The new OTA update also features all the new security and vulnerability fixes deployed with September AOSP sources. With the exciting Super SLOW-MOTION features you can take 0.2s of 960fps video at 720p in automatic mode or 0.4s of 480fps video at 720p in manual mode. The Galaxy Note 9 can shoot 0.4s of 960fps video at 720p. The OTA update is also quite big due to these upgrades. The September Patch for the Galaxy S8 and S8 Plus weighs around 554 MB in size and that for the Note 8 is around 712 MB. 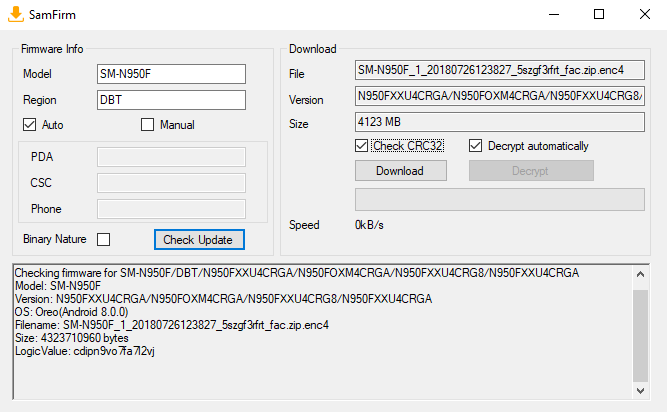 According to Samsung Mobile Update log, the Unlocked variants of Galaxy S9 and S9 Plus is also receiving Super Slow Motion with build G965U1UEU3ARH7. Also, the Galaxy S7 and S7 Edge are getting September 2018 Android Security Update. How to Download Samsung AR Emoji and Super Slow Motion Update for Galaxy Note 8, S9, S8, S7? The following simple tutorial will allow you to download the latest full stock firmware update. This tutorial will also help you upgrade to the latest OTA update if you haven’t received any OTA update for in a while for some reason. There may be some some reasons you may not have received updates. See how to download full firmware and install it manually. Note down the model number of your Samsung device from Settings > About Phone > Software information. Also, note down the CSC code or Product code for your specific region. See the list of CSC codes for all of your Samsung device region. Now, launch the SamFirm tool with admin rights from your PC. Download the latest stock firmware for Galaxy J5. Once downloaded, see How to install stock Samsung firmware using Odin tool. How to Install AR Emoji or My Emoji Maker on Samsung devices? The My Emoji Maker is Samsung’s very own AR Emoji extension for the new camera app. This September OTA updates the camera APK version to get the new AR Emoji support. Install the app and launch the camera app. You can access it by swiping right on the camera main screen.